Olbas Inhaler, Pocket Size - Penn Herb Co. Ltd. The fast-acting, penetrating vapors of the Olbas Inhaler provide an immediate, fresh, clean feeling in the nose, sinuses and lungs. It is especially beneficial during times of seasonal discomfort, low humidity and other unwelcome nasal encounters. 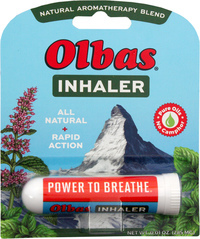 And best of all, Olbas Inhaler is non-habit forming. Pop one in your pocket or purse for instant relief anytime and anywhere. Convenient, pocket-sized nasal inhaler provide a pleasant, refreshing, and cooling sensation to your nasal passages. Especially beneficial during times of seasonal discomfort, low humidity and other unwelcome nasal encounters. Fast-acting, penetrating vapors provide an immediate, fresh, clean feeling in the nose, sinuses and lungs. Adults and children 2 years of age and older: 1 or 2 inhalations in each nostril as needed. Children under 2 years of age: consult a physician. USE DURING PREGNANCY: Although many expectant mothers have found great relief using the Olbas inhaler, we suggest you check with your doctor first before using any product during pregnancy.